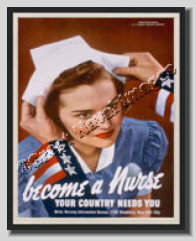 This reproduction depicts a great looking WWII vintage military poster for Nurse Recruitment. It States: "Become a Nurse Your Country Needs You. Write the Nursing Information Bureau 1790 Broadway New York City" Helped promote PRIDE and HONOR in our military and country. We guaranteeyou will not be disappointed with this item or your money back. In addition, we will replace the canvas print unconditionally for FREE if you damage your print. You would only be charged for shipping and handling. Any questions please send us an email.